I’ve featured a few designers in the past whose work we loved and appealed to our design sensibilities: deCode, Kaizad Dinshaw, Ayaz Basrai. 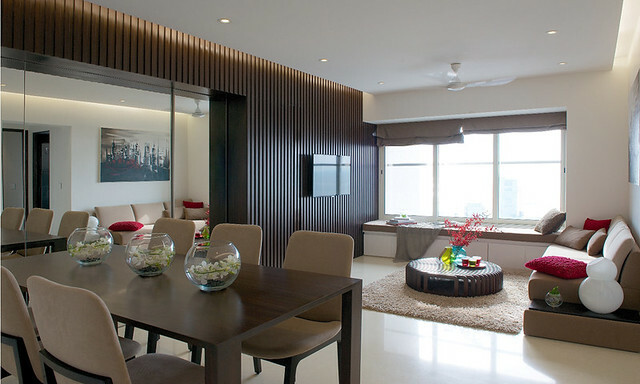 Today, let us tour a high-rise residence in Mumbai designed by yet another talented duo: the Ashleys. 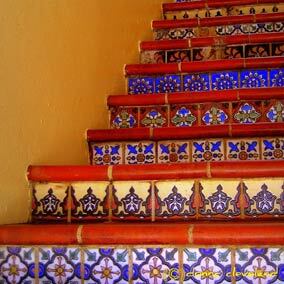 How often have you looked at a picture and wondered: is it paint or wallpaper, what material is that? This home tour is different because it describes in great detail the materials used: be it for the partition, the head board, the wall cladding etc. 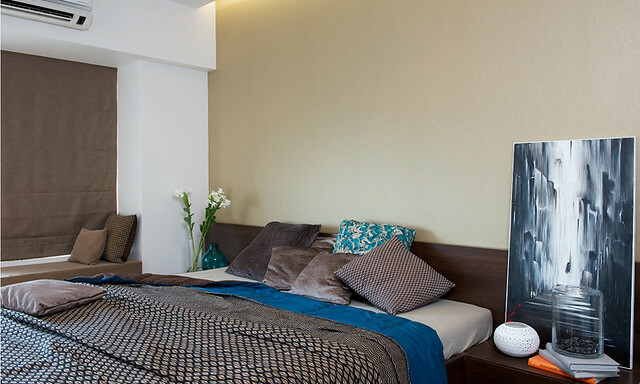 The 800 sq feet space spread on the 16th floor at Bandra, Mumbai; is a 2BHK apartment that breaks open to the alluring vastness of the sea. The first meeting with this client was elated when they spelt out the brief saying “We want to design our house as the Company’s Signature Style.” The sea, as we know, gives an Impression of vastness, meditative, yet so energetic. Our project design too speaks a similar style through its detailing in simplicity. The existing floor plan was totally remodeled to bring in a central access to the living room which is spread across to two bedrooms one on either side, with a kitchen down the corridor. Considering the space constrain, the bathroom attached to the guest room was planned in such a way that it can be accessed from the living room which act as a powder room. The access door to powder room is stylishly camouflaged with the mirror wall of the dining area, tactically done to make the small space look larger than the actual. Planned so wittily that anyone visiting this house thoroughly enjoys the way the home unfolds to offer spaces beyond walls. Fresh perspective: who says artwork should only be hung on the walls? 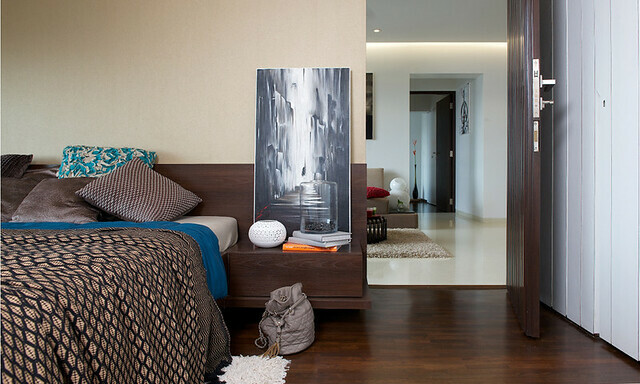 The two bedrooms have been kept minimal and styled in an individual sense. 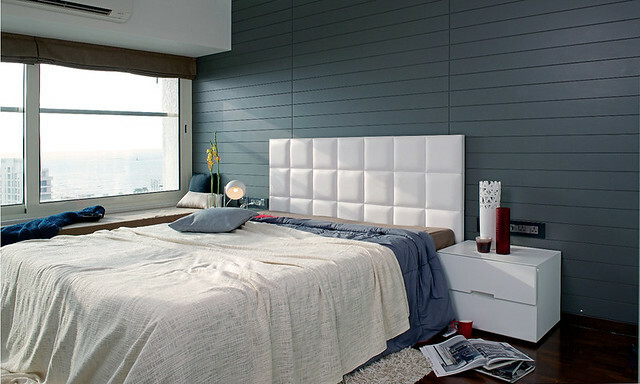 The master bed clad in leather is setup against a grooved grey wall done meticulously in POP. To achieve a high level of finesse to this wall, a simplistic acrylic form- work at the top and bottom was employed while chiseling each groove, which sets apart the room from its white canvas. Shutters down the corridor are finished in white PU (polyurethane) impeccably blends into the wall canvas to provide hidden storage which fulfills the clients need for the extra storage. The customized Center Table is a Piece of Art in itself made of strips wrapping themselves in a circular form creating an Impression of wooden strips, loosely put together to offer a platform of art and utility. Fine detailing capitulates to the high level of crisp finishing through the entire apartment. The strength of the project lies in the detailing at the micro level which defines the simplicity at the macro level. Each detail in this apartment is carefully thought and put together to build a sense of a larger space which is totally uncluttered. About The Ashleys: The Ashleys was conceived in 2004, when two sharply talented individuals, Arbaysis and Pooja each associated with reputed firms, came together and founded a design house that would deliver international quality and design value. They design hi-end residences, luxury bungalows, retail spaces, corporate setups and are fast making inroads into the hospitality sector and building construction. Adept at both, interior design and architecture, the studio is driven by constant research and evolutionary forays in relation with textures and materials – vital constituents that bring an edge to each project. Their design philosophy is that design should not speak efforts behind it, its simplicity should overwhelm you. This guest post was written by DezignGenie, a curated platform of interior ideas, products & professionals to design your dream home.